Below is the race information for the Ridgeway Revenge Half Marathon, 10K, 5K & Children's Fun Run. The Half Marathon, 10K & 5K events will have staggered event starts from 10 am, the Children's Fun Run will take place at 9.15 am. You will not receive any information in the post but there will be a reminder e-mail sent a few days before the event. Please pick up your race number and timing chip from the event HQ situated within the event car park between 8.15 and 9.30 am (9 am for children) on the morning of the race (remember to bring safety pins and race belt). The Half Marathon and 10K are tough and challenging courses, please ensure that you are fit enough to run them. Runners for the 5K event must be 12 years and over, runners for the 10K event must be 14 years and over and runners for the Half Marathon event must be 18 years and over. There are onsite ambulance services and there will be mobile medics on the course. Runners are recommended to put personal/ medical details on the reverse of their race numbers. Please can all parents ensure that all children below the age of 16 have the child's name, parent's name/ contact details and any medical conditions on the reverse of the race number. It is the runner’s or parent's responsibility to check any health issues. The event car park and the Run HQ are in the signed field car park adjacent to the start/ finish. 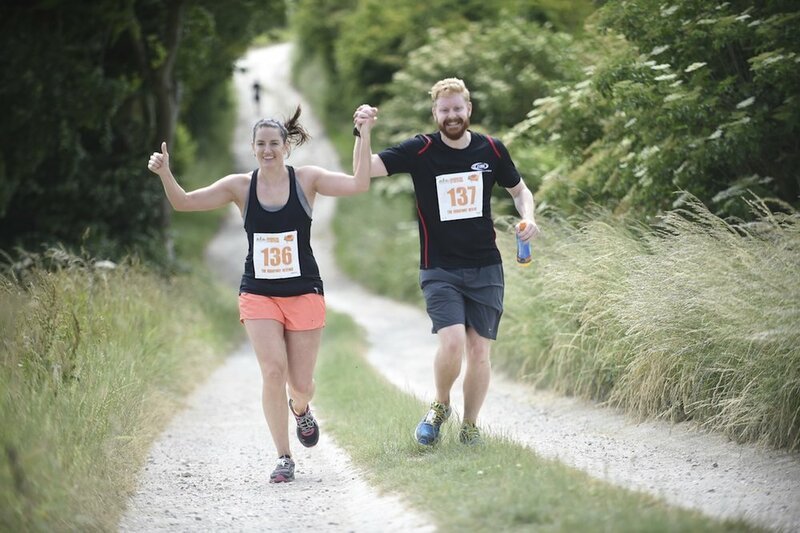 Situated approximately ½ a mile straight on from Ridgeway Farm (where Nell Hill crosses the Ridgeway), the car park, Run HQ and start/ finish will be clearly signed with our Ridgeway Revenge logo/ car park signs from entering Bishopstone Village. Please follow these Ridgeway Revenge signs. The nearest postcode is: SN6 8NZ. This will take you up Nell Hill to a well-used farm track (Ridgeway Farm buildings on your right). Go straight on, crossing the Ridgeway and follow the Ridgeway Revenge carpark signs for approximately a ½ mile to take the signed left into the event car park field. You can’t miss the cars, marquee, food and start/ finish arch. Please do not turn onto the Ridgeway National trail, this is the run course and the use of motor vehicles along it are prohibited. You will see the start/ finish gantry straight in front of you, please do not drive over this. As runners will be running down this road from 10 am – 10.30 am, for health and safety cars will be unable to access the car park between 9.45 am – 10.30 am. Runners are asked to please ensure that they have signed on before this and spectators are asked to respect this by parking well in advance of this time or by paring alongside Ridgeway Farms. The event car park is open from 8.15 am. Please have awareness to runners at all times and take care of any pedestrians/ farm traffic that may use this road on the day. The event start/ finish is adjacent to the event car park. The Ridgeway is a National Trail and it is not closed to walkers or horses. While the course is quiet and local residents will be informed of the event, please do keep to the left hand side at all times and avoid running more than two abreast. Please always listen to the instructions of the marshals. Water Stations with sweets will be at approximately 3 mile intervals along the course. Water will be provided in paper cups. Please do not litter the course with cups and gels, but use the bins provided at a short distance past the water stations. There will be a lead cyclist for the first wave, and markers will clearly sign the course. There will be a back bike following the 10K event until the 5 mile marker when they will then continue to the rear of the Half Marathon event. Event paparazzi will be capturing you at your best, so make sure you smile. Photography will be available from the results section of the website the week following the event. The race HQ is held in a marquee in the event car park field adjacent to the start/ finish gantry. The nearest postcode is Ridgeway Farm, Nell Hill, Bishopstone SN6 8NZ. Before the start of the race, all runners are required to attend the race briefing at the event HQ. This will be held at approximately 9.40 am, 20 minutes prior to the first wave’s start time. The Half Marathon wave will start at 10 am, the 10K wave will start at 10.10 am and the 5K at 10.15 am. The Children's Fun Run race briefing will start at 9.10 amwith event commencing at 9.15 am. All runners are asked to allow plenty of time to reach the start of the race. Please do not miss the start time, as the event will start without you. On finishing the race you will get an accurate run time displayed on the results screen near the finish, a finisher's medal and event goody bag. When returning to the car park, please take care of other runners, spectators and traffic that may be using the road. The prize presentation for each event will be done as soon as possible after the top 3 runners have crossed the finish line. The course is part road/ trail and grass footpath, trail shoes are advisable and spikes are banned. If the ground is dry normal trainers/ a light trail shoe are absolutely fine. Please ensure that you have enough warm clothing for before and after the event. Headphones/ MP3s are banned and any runners wearing headphones at any point during the race will be disqualified. We need you to be aware of your surroundings and able to listen to the marshals on the course. You must wear your race number on your front with safety pins or race belt. Please ensure that it is fully visible and secure, as without it we will be unable to provide you with an official/ accurate finish time. All finishers will receive a finisher’s medal and goody bag, although we don’t promise Tiffany! Bishopstone is between Junction 14 and 15 of the M4 motorway. It is approximately 8 miles from Swindon and 10 miles from Wantage. The Ridgeway Farm crossroad is located at the top of Nell Hill just outside the Bishopstone village (SN6 8NZ). The local villages surrounding the Ridgeway have a wide range of accommodation.